Wonder Woman is a guest of Steve Trevor at a secret military base where Trevor is about to blast off in a new experimental rocket ship. 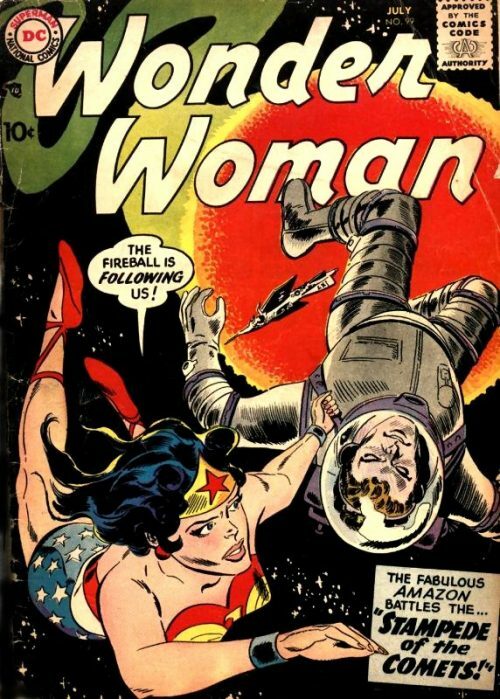 Wishing Steve luck, Wonder Woman tells him to be careful as he prepares for blast off. When the X-One gets suddenly loses all control and flies off it’s mission plan, Wonder Woman vows to go into space to rescue him. 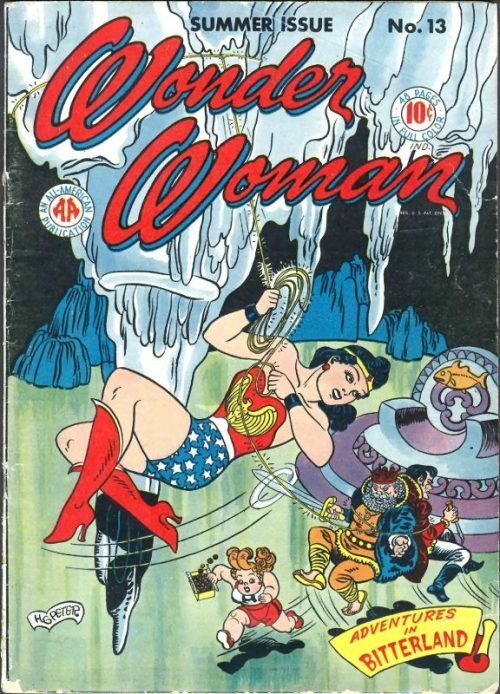 She goes back to Paradise Island where she has Paula create a contact space suit that can resist the elements and vacuum of space so that Wonder Woman can complete her mission. 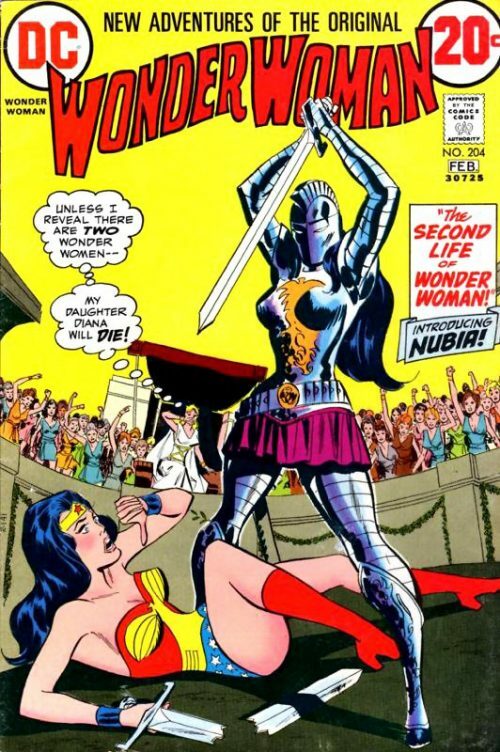 After a test to see if the suit works, Wonder Woman boards her invisible jet and flies off side-by-side with a replica of the rocket to see if the same strange occurrence could happen again. To her surprise Wonder Woman finds her plane pulled off into space and she zooms through Earth’s solar system. Coming up to Steve’s rocket, she finds that it has been heavily damaged and he is floating out in space, alive and well. When she exits her craft and goes to him, they are suddenly menaced by a comet that is flying in their direction. They move out of the comets way and watch in surprise as the comet seemingly destroys the entire Earth. 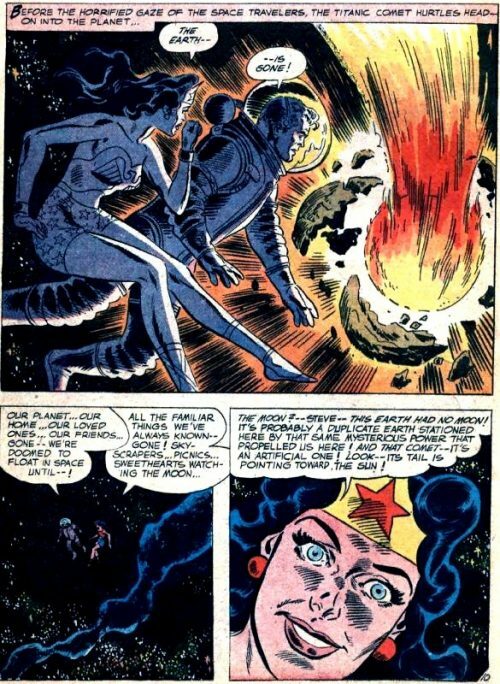 When Wonder Woman realises that there was no moon, she deduces that it was a duplicate Earth used as a test run on artificial comets as weapons. Following the comet to it’s source, Wonder Woman and Steve find the world of the Silicons, who use comets to destroy planets as a means of supplying them food by means of planetary fragments. 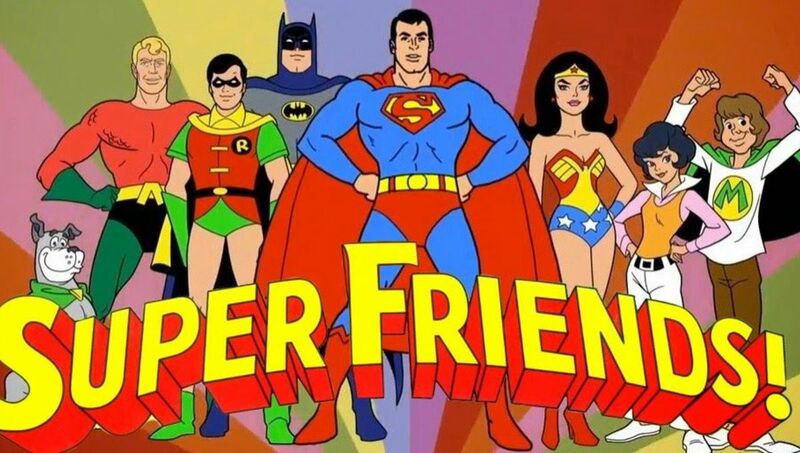 When the Silicons discover them, they launch all their comets at the true Earth and attempt to defeat Wonder Woman and Steve with their mental powers. 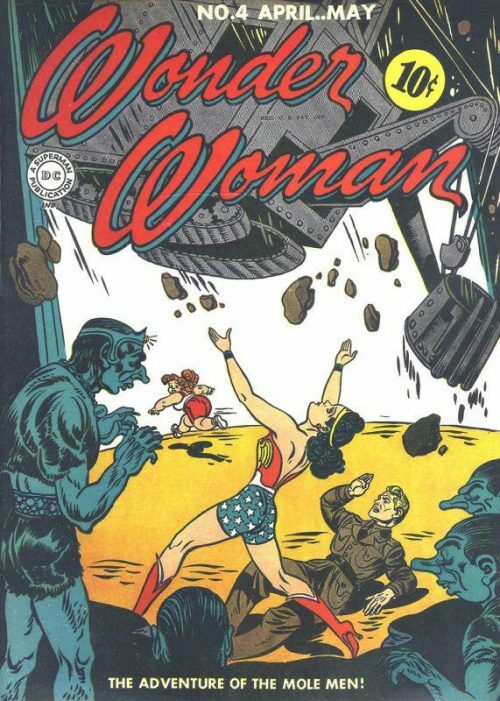 Realising that the Silicons use magnets to control their comets, Wonder Woman dives into the Silicon world gathering the material she needs to construct a giant magnet and redirect the meteors back to the Silicon’s world, destroying it and ending their threat. Now trapped in space light years away from space, Diana and Steve wonder how they are going to return home to Earth. When a real comet almost collides with them but suddenly vanishes, Wonder Woman realises that there is a warp in space near them and they use it to travel back to Earth’s solar system. 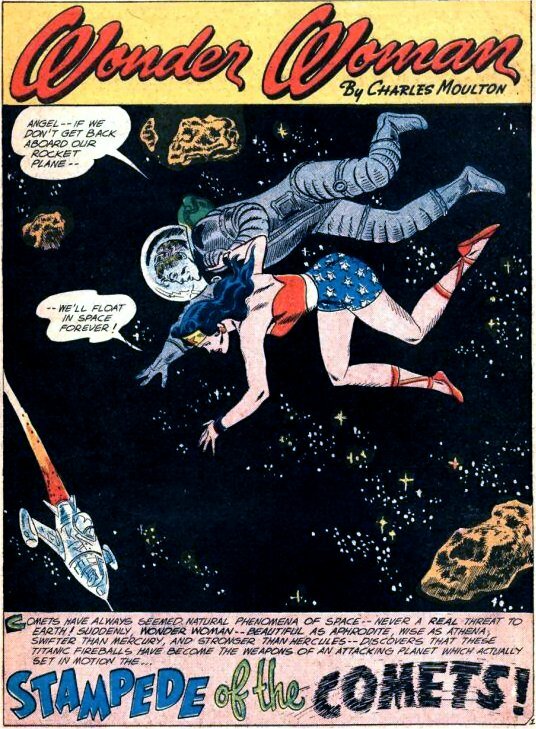 Appearing just past Mars, Wonder Woman finds that their gamble paid off and they set a course for home. 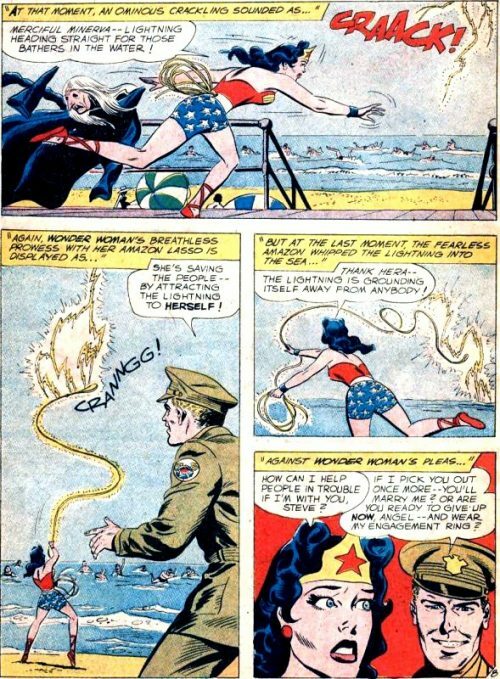 One day Wonder Woman is watching Steve Trevor put on aerial stunts when suddenly the wing of his plane breaks off. 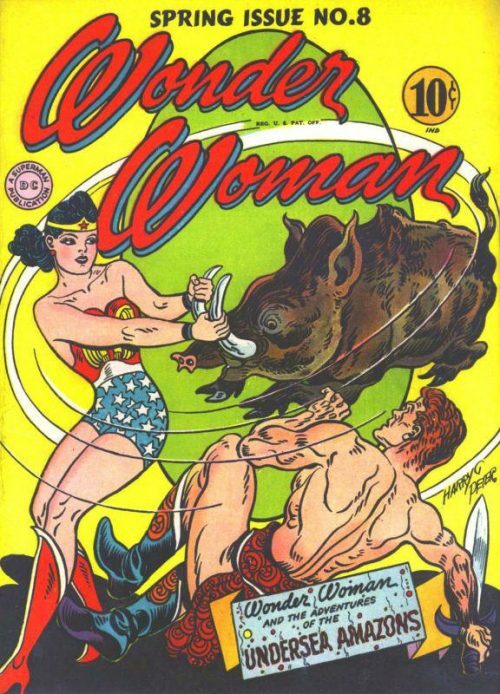 Wonder Woman acts quickly to prevent Steve from crashing and gets him safely to the ground. Grateful to have Wonder Woman looking after him, he asks her to marry him. 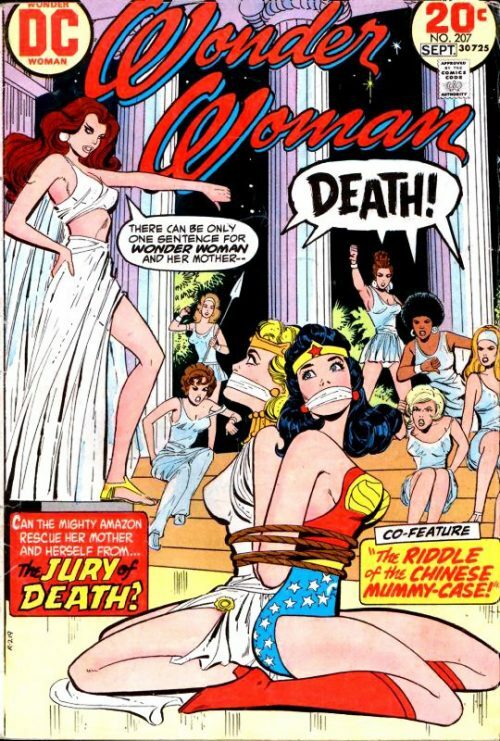 Wonder Woman respectfully declines however, telling him that she must focus on her duty to fight evil and until she is no longer needed for that job, she cannot think about getting married. Steve tells her that all he can think about is her and that he could pick her out in a crowd no matter what. When she calls him on this, he tells her that he can prove it and challenges her to prove him wrong. Taking the challenge, she tells him if he can find her three times in public, no matter her disguise, in the next 24 hours she will promise to marry him. The next day, Steve tries to make her wear an engagement ring telling her that she might as well wear it now since he believes that he is going to win. Wonder Woman takes it off, telling him that he is going to have to earn his victory anyway. Sure enough, no matter how hard Wonder Woman tries, Steve manages to find her every time. He manages to find her at a crowded beach, however when he is in the middle of gloating she has to save people riding on a roller coaster when part of the ride suddenly collapses, using her lasso as make shift tracks for the cars to ride on. Next he manages to find her among contestants in a costume contest even though she is dressed up as a hideous witch. Once again she is called away to save a bunch of swimmers from the lightning strike, using her lasso to redirect the bolt of electricity. Steve brags about how he has one more chance to find her before she has to agree to marry him, and later when they are spending time watching fire works, Wonder Woman notices that the part of her finger where the ring Steve tried to make her wear is glowing she realises that he coated the ring with some kind of radiation that he can track and this is why he has been able to find him both times. She decides to put it to a final test after she has removed the radiation from her finger. 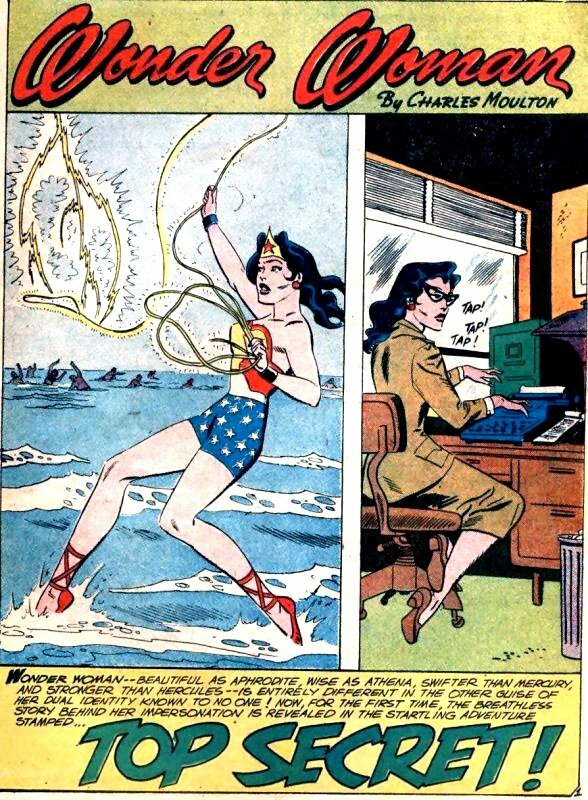 She takes on a secret identity of Diana Prince and applies for a secretaries position working for Steve Trevor to see if he can recognise her even though she’s not wearing her trademark costume and has a pair of glasses on. Sure enough she passes the gauntlet to get the position and all the other applicants drop out of the race and soon Lieutenant Diana Prince is employed as Steve’s secretary. Sure enough, Steve doesn’t recognise her and even goes out to search for Wonder Woman during his last few hours attempting to find her, completely oblivious that she is now working for him, thus securing her secret identity and allowing her to continue operating as a super-hero without being pressured into marrying Steve.